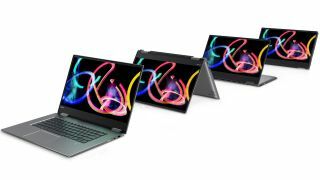 While Dell has showed us that a budget gaming laptop can defy expectations in the Inspiron 15 Gaming, Lenovo just had to one-up the firm with what might be the first potentially viable 2-in-1 gaming laptop in the new Yoga 720. Announced at MWC 2017, the Yoga 720 is a 15.6-inch version (or 13.3-inch one) of Lenovo’s iconic convertible laptop, donned in a slightly-less lavish frame than its 900 series cousins, but no less capable, if not more so. Starting at $1,099 or €999 in the EU for the 15-inch version, it comes equipped with Intel’s latest Core processor up to i7 (Kaby Lake) and an FHD (1,920 x 1,080) touch display. So far, Lenovo hasn’t revealed storage and memory information, but has teased a 4K UHD (3,840 x 2,160) screen option for the 15-inch version, as well as Nvidia GeForce GTX 1050 graphics. While all of this is naturally going to drive the price to numbers Lenovo hasn’t disclosed yet, a 4K display and dedicated graphics arguably make the Yoga 720 one of the first viable 2-in-1 gaming laptops, as shown by what the GTX 1050 Ti could do inside Dell’s machine. Rounding out the 15-inch Yoga 720’s feature set is a built-in fingerprint reader for easy Windows Hello login via Windows 10, JBL-tuned speakers with Dolby Audio Premium software and Thunderbolt 3 USB-C ports. Finally, it can last for up to 9 hours in FHD and 8 hours in UHD, according to Lenovo. The 13-inch model enjoys all of these niceties – save for the Nvidia graphics and Thunderbolt 3 – for a starting price of $859 or €999 in the EU. Furthermore, Lenovo claims to have made it more than 3mm thinner than the last generation at 14.3mm thin, and it’s now two tenths of a kilogram lighter at 1.3kg – all in a 12-inch (wide) laptop sporting a 13-inch (diagonal) screen. Finally, the 13-inch Yoga 720 is rated for 8 hours of juice at FHD and just 7 hours at UHD. Each version of the Lenovo Yoga 720 will be made available in April 2017, so stay tuned for our in-depth impressions before then. While seemingly unavailable in the US and Australia, the EU-ready Yoga 520 promises an affordable, multimedia touch experience in a 14-inch laptop, starting at €599. The Yoga 520 will offer the latest Intel Core i series processors up to Core i7 as well as FHD screens across the board and an optional fingerprint reader. This laptop also stakes claim to the longest battery life of this bunch at 10 hours on FHD. At last, both Yoga 720 and 520 laptops come in several colors, like gray, white, silver, copper and platinum and offer optional stylus support with an active pen.